I was recently invited to a hair cutting ceremony by a family in Ulaanbaatar that has taken me under their wing. The boy, Orgil was three-years old, and had nearly shoulder length hair for as long as I’d known him. Over the course of a 3 hour ceremony, friends and family members cut off locks of Orgil’s hair until it was too short to cut. 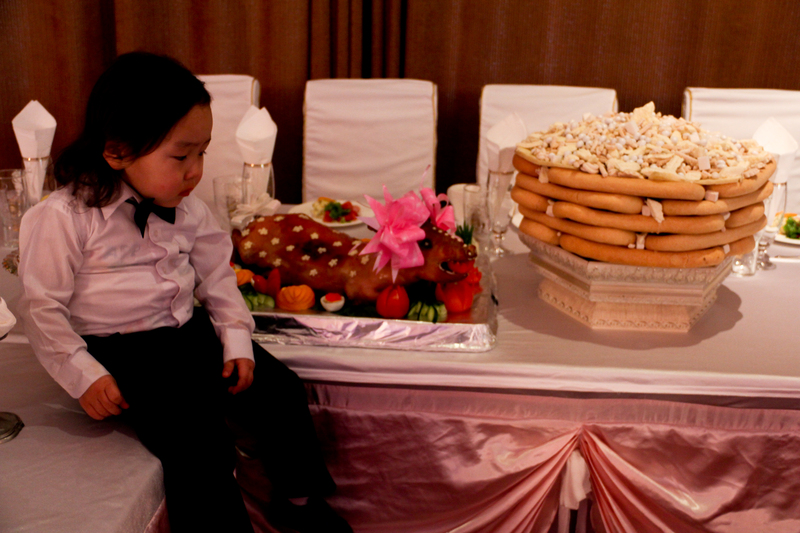 Traditionally, Mongolian parents let their child’s hair grow until they are between 3 and 6 years old. When the child has reached an appropriate age (usually 3 or 5 for boys and 4 or 6 for girls), they mark the first haircut with a ceremony. It’s a sign that the child has survived the dangers of the first few years of life. While this tradition is a time-honored, it has experienced a resurgence in the past few decades. It’s one of many Mongolian traditions and symbols that increased in popularity since 1991 when democracy was ushered in. Some ceremonies are quiet affairs, only family members and the family’s closest friends are invited. But more frequently, they are elaborate affairs. Think Bar/Bat Mitzvah or Quinceañera celebrations. Wealthier families will invite as many as a hundred guests, serving a full meal, and providing entertainment. But regardless of the size, the ceremony is generally the same. A monk or family member will give a blessing, for the child. Then the parents will cut the first lock, collecting the hair in a khadag (traditional sacred blue cloth). They will then bring the child around to all of the guests – closest family and friends are first. Everyone will greet the child saying, ‘Tom xun bolooroi!’ or ‘Sain xun bolooroi!’ (Translation: Become a big/good person). Then they will give the child a gift, usually cash ($5 – $20), but sometimes a toy. As is the case with most ceremonies centered around young children, this is mostly for the benefit of parents and family members and serves as a good excuse to celebrate. I have only been to one hair cutting ceremony, and so it’s difficult for me to know what is typical, but I suspect this was not. The family held the ceremony in a banquet room of the hotel they own. They served the guests a three course meal and had ample vodka, beer and juice available. An emcee guided us through the entire evening, and we were entertained by a morin khuur (horse-head fiddle) player, traditional throat singers, and even a Mongolian pop star who’s zenith was in the 1980s. It was pretty amazing. The plate of fried cookies topped with candies and curds, called a ‘heviin boow’, is a common centerpiece at most formal celebrations. Very nice and unusual post. I loved the video! Very cool. I love learning and being entertained at the same time. The music, videos and photos are so VIBRANT.